Paul Wages, a senior firearms instructor at Defensive Solutions in Powell, Tennessee, shoots a target at a local gun range. But in addition to helping craft legislation, the NRA enjoys another role as state-sanctioned gun educators. In fact, the NRA shows up three times within a separate law governing the requirements for getting a permit to carry a concealed weapon. This dual role seems to paint a cozy relationship between Florida and the country's largest gun proponent, raising eyebrows among observers about the power of special interests in Tallahassee. State Sen. Chris Smith, D-Ft. Lauderdale, referred to the power of the NRA in influencing state policy at the beginning of the 2013 legislative session, explaining that getting any gun control measures through the legislature would be extremely unlikely. “Marion Hammer will ensure that we don’t,” Smith said. Hammer is the NRA’s lobbyist in Florida. Every one of the more than a million gun permit holders in Florida is required to demonstrate what the law calls “competence with a firearm.” And that’s where the NRA comes in. You can demonstrate “competence” in a number of ways, one of the most common is to take a class. 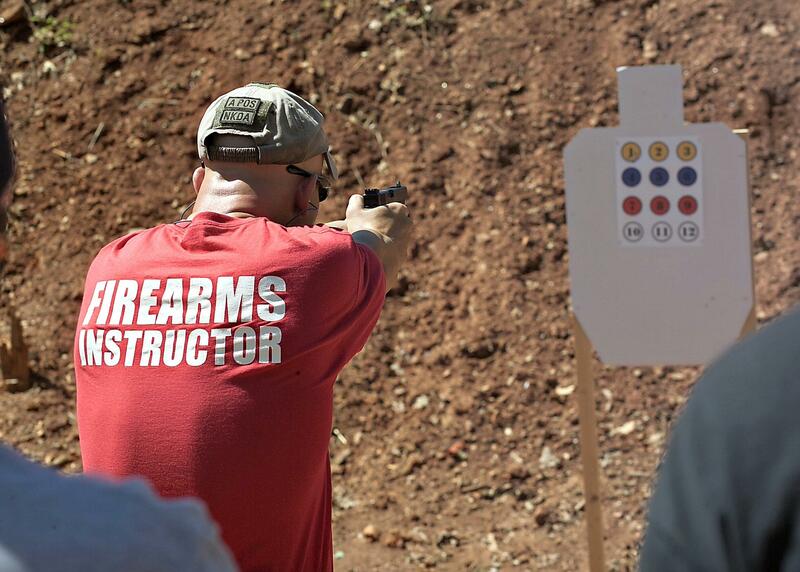 These classes have to be taught by an instructor certified by one of two groups, the State of Florida or the NRA. The law actually lists the NRA first. Allen Lill is an NRA training counselor. Lill trains people who will become instructors. He agrees with Baxley that the NRA being able to certify instructors isn’t a problem, but added that there is a problem with the way the state treats these certifications. He said after people get certified, they can teach whatever and however they want. Lill points out that these are not NRA courses, but the instructors are certified by the NRA. This means the 40 minute-lecture and the firing-one-shot-into-a-bucket would qualify as showing competence with a firearm. The agency that handles concealed weapons permitting, Florida's Department of Agriculture and Consumer Services, also does not provide any sort of oversight for instructors. Currently, the Florida Legislature does not delegate to the Department of Agriculture and Consumer Services the authority to regulate or restrict the issuing of instructor licenses so they do not have control over the certification process or what those instructors teach. Why Florida Picks Fights With The U.S.
Florida’s top prosecutor wants to overturn a federal gun law and allow 18 year-olds to own handguns. It’s just the latest example of the Sunshine State battling the federal government. It’s done it over health care, voting rights and now gun control. The only gun control measure passed by the Florida Legislature this year is finally on Gov. Rick Scott's desk. It puts people who are committed for mental health treatment on a list that prevents them from being able to buy a gun. The National Rifle Association usually fights any proposal that could erode a person's right to bear arms – also known as the U.S. 2nd Amendment -- but the association strongly supports this bill. The Melissa Institute for Violence Prevention commissioned a survey last month to measure South Floridians' attitudes about guns as opposed to the rest of the state. Results show residents overwhelmingly support background checks for all gun purchases. The institute in South Miami was founded by Lynn Aptman. Her daughter Melissa was shot to death during a carjacking in St. Louis two weeks before her college graduation in 1995. Results from a Quinnipiac University poll last month show Florida voters like the idea of universal background checks for gun buyers. They also like the state’s “Stand Your Ground” law. Senate Minority Leader Chris Smith, D-Fort Lauderdale, isn't surprised by either of those results. The horrific killing of 20 schoolchildren in Newtown, Conn., revived the debate over gun control in the United States. President Barack Obama outlined his controversial proposal for gun control last Wednesday, including requiring criminal background checks for all gun sales, strengthening the ban on assault weapons, and limiting high-capacity ammunition magazines. The Florida Legislature passed a gun control measure this year that would prevent more people with mental illness from buying guns. It essentially closes a loophole that enables people who seek mental health treatment to buy guns. The bipartisan bill even got strong support from the National Rifle Association. But some critics think it may do more harm than good.